Cancer can be a heart breaking thought for the woman who has yet to start a family. With the help of the cancer treatment team and advanced fertility options, motherhood is not out of the question in all cancer cases. The cancer treatment doctor will be very up front about a woman's chances of having children after cancer. The different forms of cancer and cancer treatments mean not every case will affect fertility in the future. If the cancer requires advanced treatment, such as major surgery, chemotherapy and / or radiation, the fertility chances are lessened. In addition to fertility options, the cancer patient needs to ensure in most cases that pregnancy does not occur during treatment. Radiation treatments for cancer, especially if they are directed towards ther uterus can affect the fetus and cause harm. In some cases, the fetus can die or can have physical abnormalities, mental abnormalities as a result of the radiation cancer treatment. Chemotherapy on the other hand is more often than not safe to the fetus, and pregnancy can usually continue depending on the kind of chemotherapy used. Contraception should be used for a minimum of one year after cancer treatment has been completed. This gives the cells of the body enough time to rejuvenate and recover from the effects of chemotherapy or radiation. Why Does Cancer Treatment Cause Infertility? In cancer cases where radiation therapy for cancer is directed twoards the ovaries, the eggs are often killed along with the cancer cells. The female body knows the length of time to menstruate based upon the number of eggs left in the ovaries. If there are no viable eggs or most eggs have been destroyed by the cancer treatment, the body will assume menopause is the next step. The eggs are not the only part of the female reproductive system affected by cancer treatments. In some cases reproductive hormone levels may be too low after treatment for conception. The female may also have a damaged endometrial lining which prevents the fertilized egg from attaching and growing in the womb. The effect of the cancer treatment on female fertility will depend on the type of cancer treatment chosen. The choice between chemotherapy drugs will be made based upon the type of cancer and the stage of cancer being treated. If the cancer treatment team understands the woman's need to have children after treatment, the type of chemotherapy drug could be changed to one that is less likely to affect fertility. Radiation has a localized affect on female fertility. 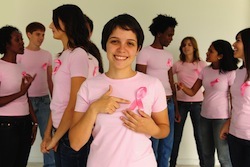 In cases of breast cancer, for instance, the breast is radiated and not the reproductive system. While there may be a lull in fertility, the woman should be able to conceive after radiation treatment to an area other than the pelvis. If the pelvis area needs to be radiated, there is little the cancer treatment doctor can do to maintain fertility after treatment. The only reason surgery for cancer removal would affect a woman's fertility is if the area removed is in the reproductive system. Women have one advantage over men in regards to fertility after cancer treatment. If the patient finds they are in early menopause, hormone replacement therapy could be chosen to boost egg release and increase the chances of fertility. Hormone replacement therapy can only be used in cases where the cancer does not depend on hormones to grow. Methods of preserving fertility in women who have cancer are not that different from other infertility treatments. The patient has the option to harvest eggs and have them frozen for use after the cancer treatment has been complete. If the womb is affected, the eggs can be used in conjunction with the male sperm and a surrogate mother. The resulting baby will be a biological baby of the female. The eggs will need to be harvested and stored before the cancer treatment is started. If the eggs are not harvested and the treatment has left the woman without the ability to have children, a donor egg can be used to conceive children. If the womb is intact, the donor egg can be implanted in the uterus and the female will be able to have a baby of her own. In cases of cervical cancer where the cervix has been sewn closed, the female will still be able to hold a fetus to full term as long as the uterus was not damaged by the cancer treatment. The baby will be implanted into the womb and if the pregnancy takes, the fetus will be born via C-Section.